Yes, it’s that time of year again when the Sunday papers are twice as thick due to all the Back to School advertisements and circulars to excite and entice students, teachers, and parents alike. There’s nothing more satisfying than a shiny new binder, a brand new pencil case, and never before used pens, pencils and markers, especially for teachers. These are the tools of our trade. So as you are clipping coupons, marking your calendars with Teacher Appreciation events, and calling everyone you know to pick up a dozen one cent pocket folders (because that’s the limit per person), we thought we would share with you a few of our thoughts about the tools you will need to make the best charts ever this year. 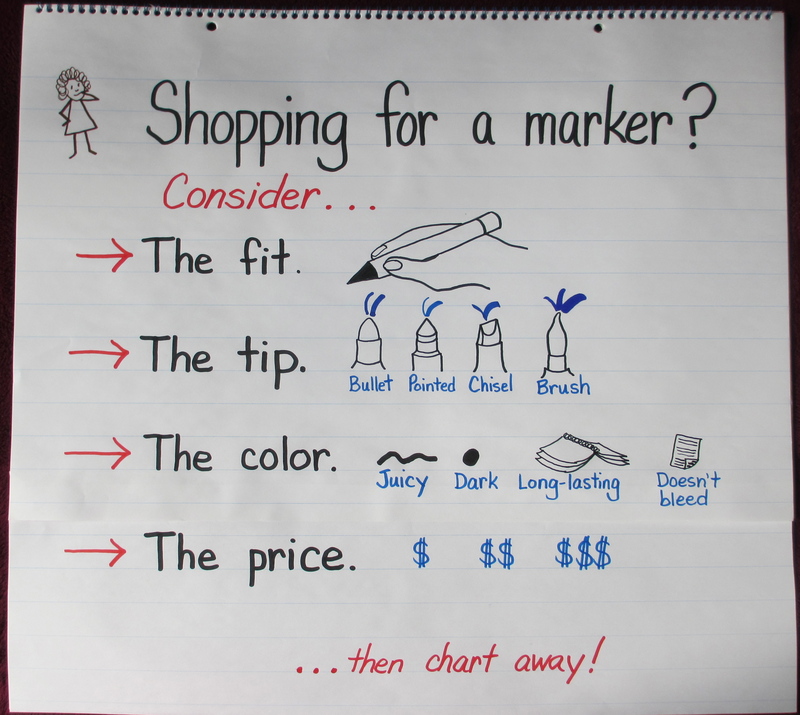 A chart for teachers on choosing markers. The type of tip you choose will depend on some personal preferences, like how it fits in your hand. After all you will be holding these markers all day, every day. Marker tips also come in several different shapes. For example, if you like your printing to have a calligraphy-type look, then a chisel point or a brush tip might work best. If you worry about how your handwriting looks, try a bullet tip marker because this kind of tip has a more consistent line and the thickness makes the writing stand out. If you tend to press down really hard as you write then a pointed hard tip might work best. Also, markers that have intense, rich, ‘juicy’ color that does not bleed through are always desirable, as are ones that last a long time. Another suggestion is to stock up on black and blue markers because these are the ones we recommend using for the bulk of the writing on any chart, which means they will tend to run out more often. The other colors are used more for accents or highlights, so last longer. As for price, shop the sales and clip those coupons. The other tool chart makers will need is paper. For those of you who have been following us for awhile, you know that in addition to the classic chart paper pads (both lined and unlined, white and colored, full-size and half-size), we often use large florescent colored sticky notes which allow us more flexibility in how we build charts with students. Ready made 6” x 8” post-its come in neon green, orange, yellow, pink, blue, and red and are available in many office supply stores, retailers and on the internet. But, we also love being able to turn any piece of paper into a sticky note with the use of a repositionable or restickable glue stick. What’s nice about this favorite tool is we can purchase multi-colored 8-1/2 x 11 copy paper and use this to make our charts. Besides being able to be used over and over again, there is no sticky residue left behind. 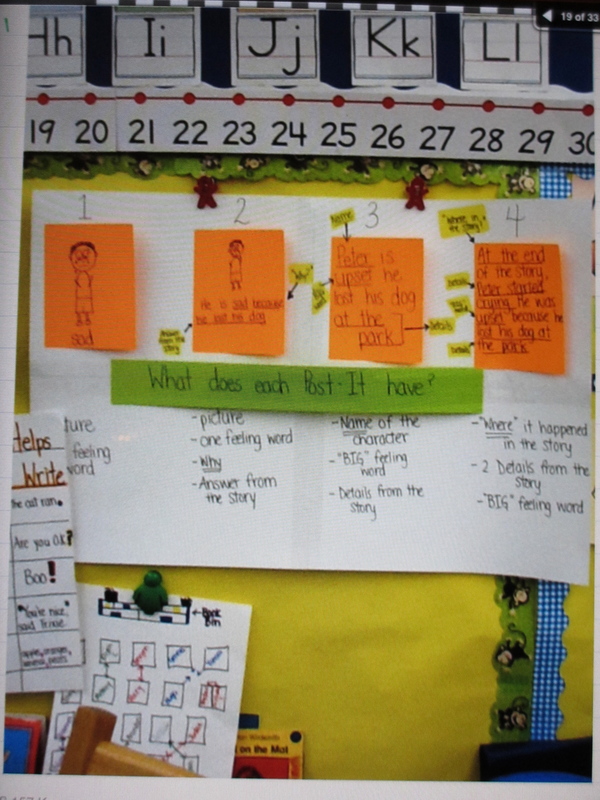 Below is an example of a chart that used both the ready-made post-its and the self-made sticky notes. On the left are 6×8 Post-its and on the right the sticky notes are made from 8-1/2 x 11 copy paper using a repositionable glue stick. Lastly, children love seeing themselves on the charts hanging around the room, so plan on having some kind of digital camera, smart phone, or tablet that will allow you to take snapshots of your students in action as they follow the strategies and steps you have taught. Together you and the children can choose which photos are the clearest examples and add them to the chart to remind and reinforce the problem-solving stance that will help everyone become more independent and resourceful as learners. If you adhere these photos to the charts using a repositionable glue stick it will make it easier to change and update the photos as needed. Remember, the more you touch a chart and revise it, the more likely the children will pay attention to it and actually use it! Kristi used photos of some of her students and added speech bubbles to show what they said about their theories. Have fun shopping and let us know if you have any other must-have tools in your chart-making toolkit. In the Italian preprimary schools in the Reggio Emilia district of Italy, the environment is considered the third educator, alongside the teachers and the parents. They have successfully shown that what surrounds our children becomes influential models, whether they are the teachers, the parents, or the environment. The charts that are hanging in each of our classrooms are an integral part of this environment, which can have a powerful effect on children. Charts not only record our teaching, but they are powerful models for children to look towards and mentor themselves to in order to do what they are trying to do even better. Models and mentors are a valuable asset when it comes to learning something new. They become even more valuable when it comes to learning how to do something even better. We often think about “mentor authors” when teaching revision and craft in writing on the way towards publishing and reaching a targeted audience. But mentors and models are useful no matter what it is you are trying to make better, whether improving one’s writing or learning how to improve one’s home decorating skills. Donald Crews and HGTV have one thing in common – they both provide models that not only inspire, but seem accessible and do-able. But models and mentors can provide a vision and a pathway no matter the subject. Today’s post focuses on a small, but often annoying tool children are often asked to use to hold onto their thinking while reading: the post-it note. We have heard many a teacher lament that these small tools are being poorly used and not very helpful as a result. They find more post-its on the floor than in the children’s books. Rather than encourage intricate, thoughtful thinking, they are often used to demonstrate intricate origami folding patterns that have nothing to do with reading. 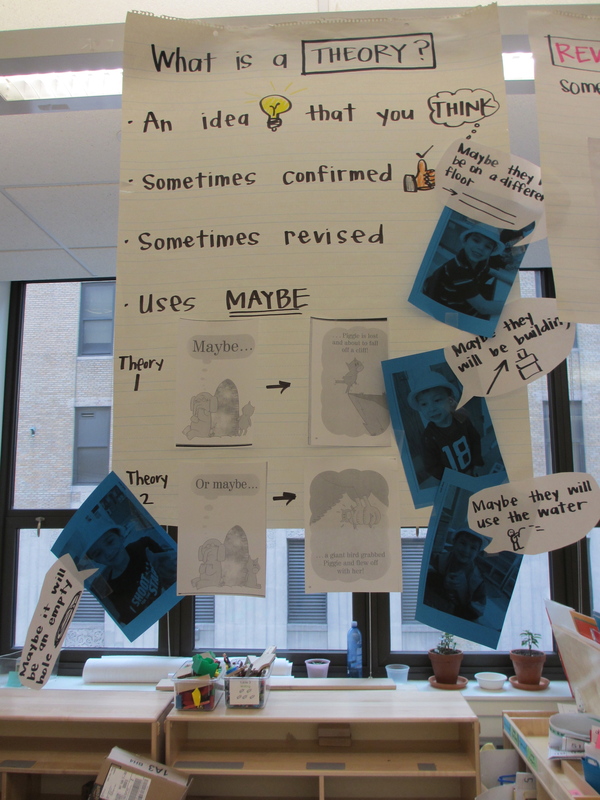 One resourceful and thoughtful teacher in the Bronx, Kathleen Snyder at PS 157, decided to explore this universal dilemma by thinking about why her kids had random post-its scattered everywhere, throughout their books and everywhere else. She started by asking, “Why do you use post-it notes?” and “How did you decide what to write on the post-it note?” What she discovered was that many children understood the post-its were to be used to record important places in their books, but they were less sure about what to actually write on the post-it. Together we decided to come up with some model post-its that would act as mentors that would support the children by showing them examples of what to write and to encourage them to write even better notes about their reading by providing a continuum of possible notes. 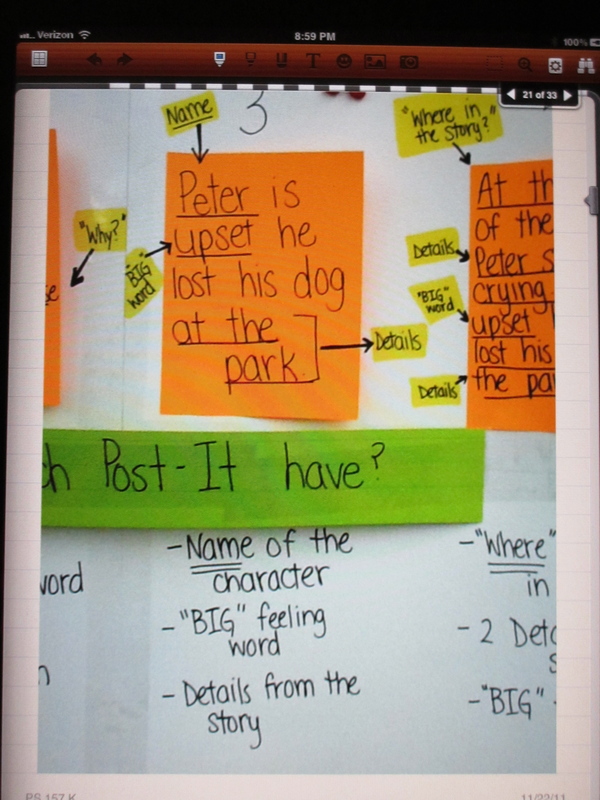 This chart is set up like a rubric and shows a progression of Post-it examples and specifically names what has been done under each post-it. If we consider a possible progression, the first might be using symbols to mark thinking without any writing. You might ask, What can you draw to show how the character is feeling? Then, you can move towards the use of general words to describe feelings or facts. For example, you might ask, What is a word for that feeling? Have you ever felt that way? The next step is to elaborate on this basic thinking by using more specific words along with examples or reasons. At this stage we want to encourage children to ask lots of why and how questions. 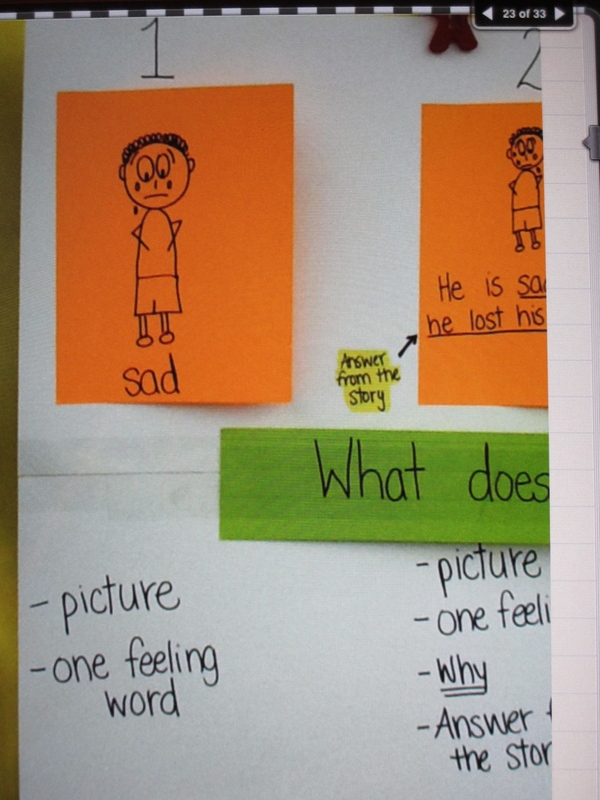 This model post-it shows that readers not only state a fact (he is sad), but they add a because (he lost his dog). The next stage is to expand on the literal explanation for how a character might feel to adding in not only the why, but what else might happen, support this thinking with examples from the text, and talk about what has changed. Moving to more specific words with reasons or evidence. Ultimately we want to show children how they can use all they have learned and accumulated as they read forward in a book to make better predictions and even more interesting interpretations. 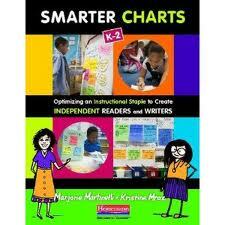 Synthesizing and summarizing helps children realize there is more to reading than just figuring out random words. 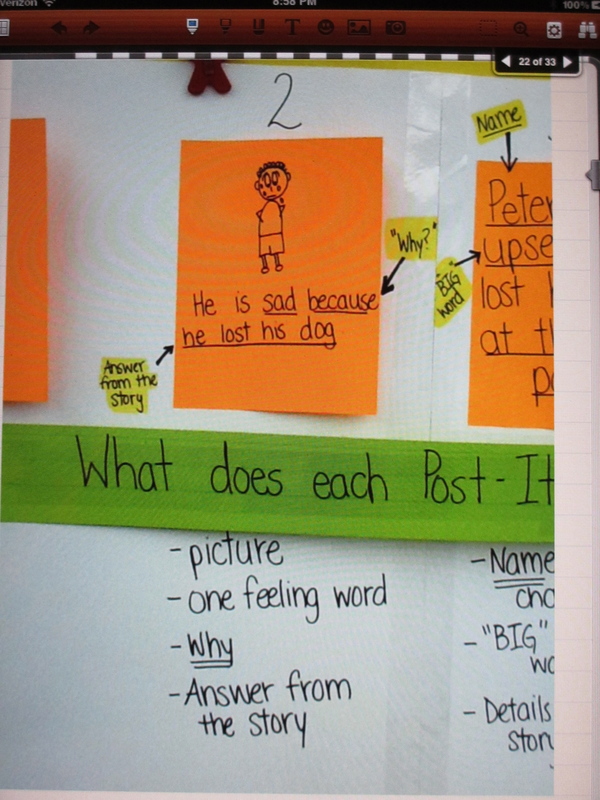 This post-it models how readers think about cause and effect and also include supporting details. Post-its are only a tool. They are not the end all reason for using them. They are actually a very concrete way to introduce young children to the concept of note taking and keeping track of thinking. The thinking is key. 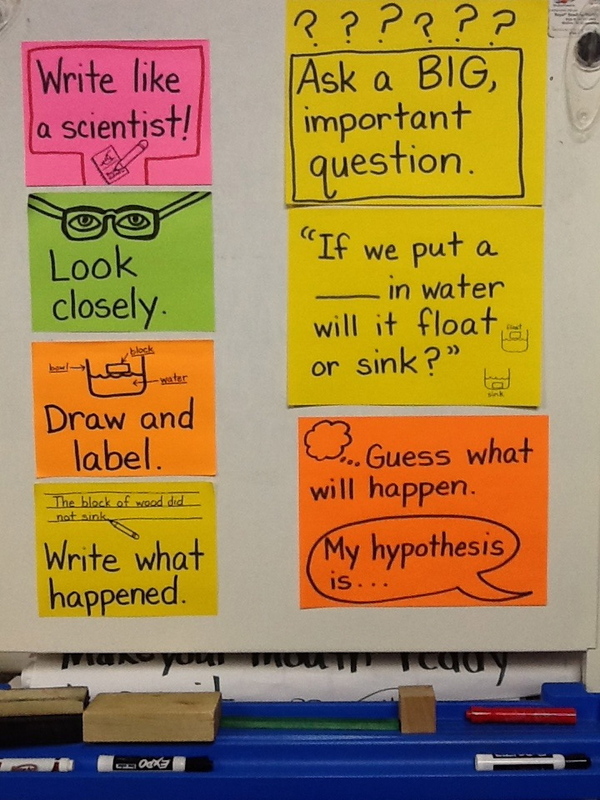 What makes the last post-it more powerful than the first one is it begins to answer some open-ended questions that encourage thinking. What, why, and how are great question starters that can launch further investigations. But how exactly to capture the thinking and ideas in a way that is efficient and helpful requires models children can mentor themselves to in order to make sure they have have a structure to follow and, ultimately, to move beyond. A first step is providing models and mentors for the basic tools that will later become critical as children begin to internalize the external models they have been immersed in and influenced by the third teacher – the environment. 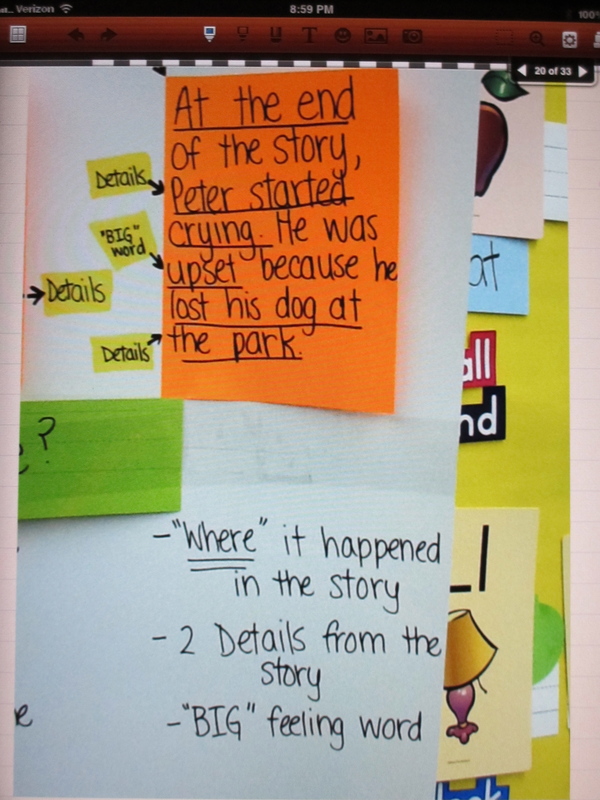 Even something as simple as a jot on a post-it note needs to be modeled and the model displayed for children to refer to just like they refer to a mentor text to craft their writing. The charts we create have a definite influence on what we teach, but even more importantly, on the children sitting before us each and every day. We will be taking a short break from the blog in order to finish our book (Smarter Charts-Heinemann) and other fun stuff, but we plan to launch a new blog post by the end of February.